And we're back! After two months away from LetsLunch, I finally decided to get back in the game this month for guilty pleasures. It was tough choosing my favorite guilty pleasure. I pretty much love all food that can be considered a guilty pleasure. Cake? I love it. Potato chips? I can't even keep them in my house anymore. Pizza? My favorite food since age 4. Large quantities of ice cream? Keep me away. In the end, I chose the ultimate breakfast food: biscuits and gravy. 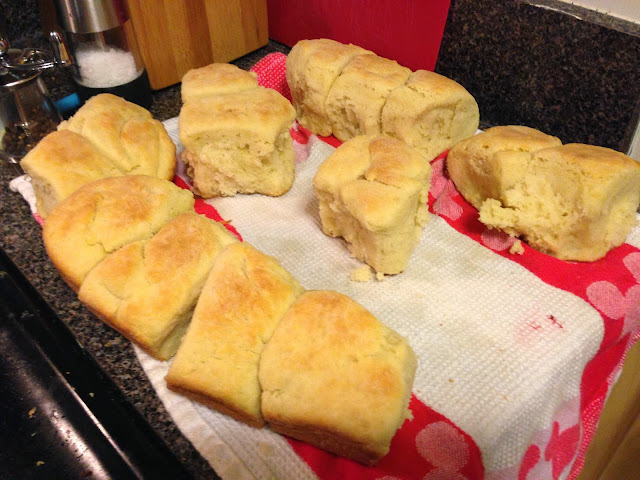 Biscuits are one of those amazing foods that are so perfect and versatile, yet hold zero nutritional value. Every so often, I make a big double batch of biscuits (I'm partial to this very simple Amateur Gourmet recipe) and freeze them. I'll pretty much eat anything on a biscuit: jam, honey, cheese, chicken, and of course, sausage gravy. These aren't exactly your perfect, round biscuits (you don't have to roll them out), but they are tender and fluffy. I think they also hold up really nicely through freezing and defrosting. For the gravy, you can use any gravy recipe you like. I usually more or less follow this one from Pioneer Woman. One of my favorites is to substitute breakfast sausage for a nice andouille or even a chicken sausage (you need to add a little more butter for that, since it doesn't produce as much rendered fat). Keep it hot until you're ready to serve, then break open the biscuits and pile on the gravy. LetsLunch is a monthly meet-up of bloggers from around the world. Check out everyone else's guilty pleasures below, or by searching the Twitter hashtag #letslunch. Want to join us? Send a tweet introducing yourself and use the hashtag. Ann Marie's Breakfast Club Sammy at Sandwich Surprise! These homemade biscuits and sausage gravy definitely will make my family ask for more and more. I better make a double batch. Heading over to the links for the recipes. It was fun doing #LetsLunch with you! 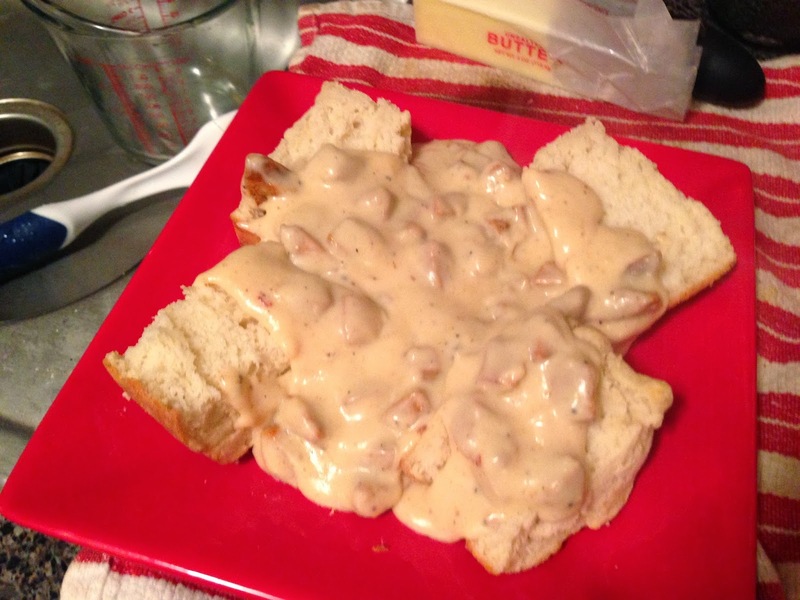 I love biscuits and gravy, but have never thought of making it at home. I saw a very sad thing the other day... in the pantry of a soup kitchen, there were huge cans of sausage gravy. Okay, that wasn't the saddest thing there, but foodwise... biscuits and gravy seem like they should be made from scratch. Ooh, those biscuits look fantastic! Biscuits and gravy. Definitely a guilty pleasure. For just the two of us I don't make biscuits often, but they are best with gravy.